If you would like to participate in one of our programs or become a volunteer please sign up below. Community Cycles is not the only bicycle collective out there, we're part of a much larger movement. 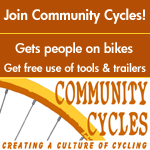 There are over 110 bike collectives and co-ops in the United States and Canada. Next time you're traveling, seek out a collective and let them know you love them.